According to the latest blog posts in the website of American society of Microbiology, Scientists have sequenced the genome of the fungus Pneumocystis jirovecii. This advancement may help identify new targets for drugs to treat and prevent Pneumocystis pneumonia, an important cause of opportunistic respiratory tract infections in immunocompromised patients, particularly AIDS patients.The study will be published on December 26, 2012 in mBio®, the online open-access journal of the American Society for Microbiology. Pneumocystis Jiroveci cannot yet be isolated and grown for study in the laboratory, so details about Pneumocystis pneumonia, the biology of P. jirovecii, and its pathogenicity are hard to come by. The genome sequence represents a wealth of new information for doctors and researchers tackling this disease. 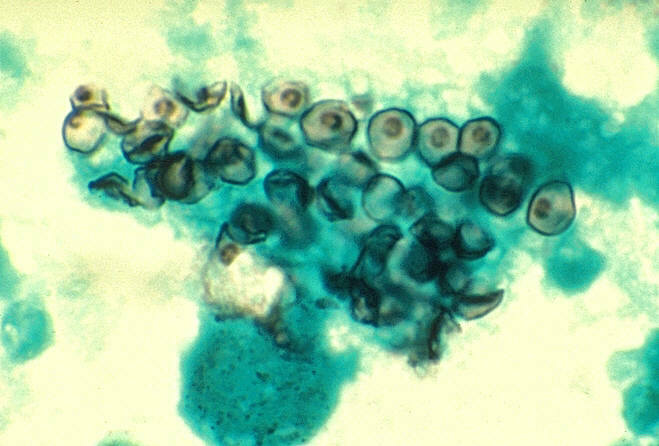 Cysts of Pneumocystis jiroveci in smear from bronchoalveolar lavage. Methenamine silver stain. “Recognized first among malnourished infants, P. jirovecii pneumonia became a public issue with the advent of the HIV epidemic,” says Philippe Hauser, The corresponding author of the study in mBio®. Today, the disease most commonly affects HIV-infected persons who are unaware of their status as well as solid organ transplant recipients and patients with hemato-oncologic or autoimmune diseases. Under normal circumstances, scientists sequencing the genome of a microorganism simply extract DNA from thick cultures of cells they grow in the lab. Since they were unable to grow P. jirovecii cells for their genomic DNA, Hauser and his colleagues took a different approach. Created copies of the DNA in the sample using a technique called random DNA amplification. This mixture of DNA strands, from P. jirovecii, human, and other microbes from the lungs of the infected patient, was then sequenced using high throughput technologies. This is the first time scientists have assembled the genome of a fungus from a mixed pool of DNA from a single source, often called a metagenome. P. jirovecii is a parasite that must live within the human body to survive because P. jirovecii lacks the genes necessary for creating some of the essential ingredients of life. “It implies that they need their host to provide these molecules and human beings represent the reservoir of this pathogen,” says Hauser. This is useful information, since it means that people are the only significant source of the organism and that both infected people and healthy carriers represent the only control points for limiting the spread of the disease. In the study of infectious disease, access to the genome of a pathogen provides new information that can be pivotal in combating the diseases it causes. The hope is that the genome of P. jirovecii will lead to new advances in therapies for those suffering from Pneumocystis pneumonia. The current drugs of choice for treating Pneumocystis pneumonia are antifolates, but certain isolates of P. jirovecii have already developed resistance to antifolates, an ability that is very likely to spread. Now that the genome of P. jirovecii is assembled and available to researchers all over the world, scientists can tease out clues about the organism that will help identify targets for some badly needed new drugs. A copy of the article can be found online at http://mbio.asm.org/content/4/1/e00428-12. Thought to be a protozoan. Presently it is believed to be a fungus. Pneumocystis jiroveci is common in the environment and does not cause illness in healthy people. In tissue it appears as cyst: That resemble the cyst of Protozoa. Requires tissue culture/cell lines for its growth and viability. Alevolar type II cell hypertrophy: Macrophage infiltrate and filling of alveolar spaces with foamy eosinophilic material and plasma cells. Foci of necrosis and cellular debris in extrapulmonary sites. Specimen: Lung tissue, fluid obtained by bronchoscopy, bronchial lavage or open long biopsy. Microscopy: visualization cysts or trophozoitic forms after Giemsa or other tissue staining.